Sinclair Lewis won the Nobel Prize for literature, was ripped off of a Pulitzer by the Columbia University trustees, won it for real later, declined it, wrote Babbitt, and eventually hired secretaries to play chess with him until he croaked from the effects of alcoholism. Somewhere in all this, he found time to pen what has to be regarded as the definitive novel about the nature of religion as Big Con. Really though, it isn’t religion that is portrayed that way, so much as all the people selling it to the masses. 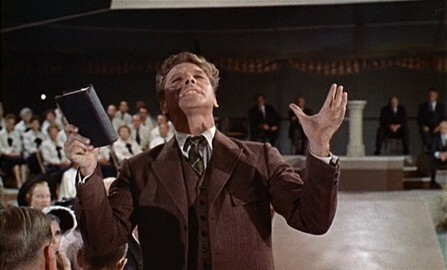 The movie sets up the debate nicely with the interplay between small time grifter Elmer Gantry (Burt Lancaster), who has become an overnight sensation selling his brand of high octane evangelism, and the big city reporter who is traveling with the revivalists, covering their activities. Gantry is a traveling salesman who spends his days in bars telling dirty jokes to keep the buyers laughing and in the mood to buy the vacuum cleaners that they’ll never be able to move. His life is a series of one horse towns, cheap hotels, and nameless women, a fact that he basically acknowledges later in the film. He’s a con man through and through, even lying to his mother on Christmas morning about whether she ever got some present he never cared enough to actually buy. 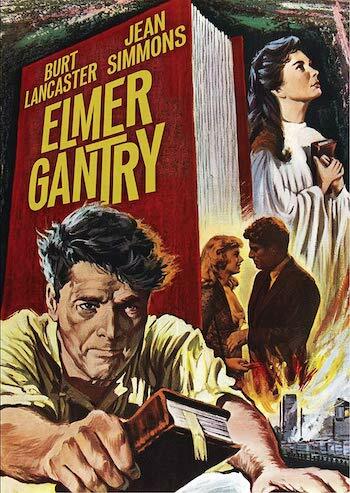 Gantry is as about as far away from piety as you can get (and the film equally as far away from subtlety), waking up from a one night stand and leaving like a thief in the night on Christmas, his celebration of the birth of Christ is reduced to writing “Merry X-Mas” in red lipstick on the mirror in the motel room where his cheap skank is still passed out! Don’t get the idea that this is all boring symbolism about what hypocrites we are all and how we shouldn’t both elevate people to heights that they don’t deserve or knock them down to similarly unfair depths because we’re angry they turned out to be merely human after all. The film also features bumfights! 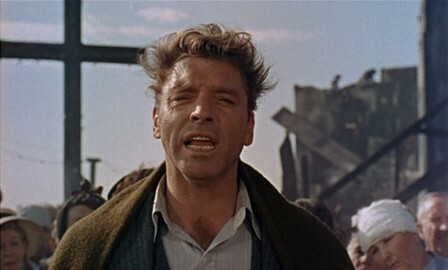 See, the next thing we know, Gantry is beating up a boxcar load of bums! One of them tries to steal his shoes and Elmer cleans house before jumping from the train! He ends up in church with a black congregation and when he eagerly sings their hymns and shovels coal for some food, we can see that his belief isn’t a total con. Oh, he’s not above using religion and his ability to sell people stuff they don’t need or want to get ahead, but the reason he’s so damn good at it, is because he believes in it in his own way. He just believes in making God work for him as much as he works for God. This scene in the black church is important because it establishes this seeming paradox within Gantry – he’s conning the people he preaches to and he’s also conning himself. They believe that he really wants to save them and Gantry believes that he really doesn’t want to and the truth lies somewhere in the middle. Remember though, at the heart of all this revivalism is a girl. There’s nothing like a pretty gal to either make a guy forget his religion or pick one up in a hurry. 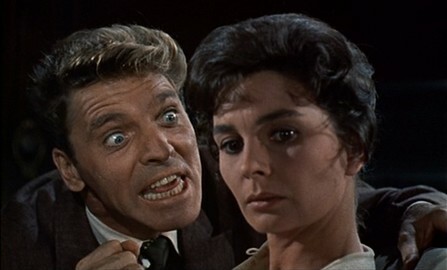 In this case, it’s Jean Simmons as the sweet and very devout Sister Sharon. Sister Sharon is completely wedded to the idea that she is doing God’s work and is delivering folks from evil. But it turns out that she isn’t any less a fraud than Elmer is. Sister Sharon is really Katie Jones from Shantytown and she only does tent revivals to make enough money to build a tabernacle of her own so that she doesn’t have to travel all the time. At first, she’s leery of Elmer and his motives, finding his preaching style and manners to be loud and vulgar, but you know how the ladies like bad boys, especially when they’re movie stars like Burt Lancaster, and so it should come as no surprise that she is as interested in him as he is in her. Elmer and his wild, crusading style are an instant hit with the people and it isn’t long before he’s leading a mob of citizens in Zenith (once Elmer and Sharon get called to play in the big leagues in Zenith, you get a cameo from Sinclair’s most famous creation, Babbitt!) to roust speakeasies, whorehouses, and the Democratic headquarters. It’s during Elmer’s raid on a whorehouse that he runs into old flame who would later cause Elmer’s inevitable downfall. The movie’s two and a half hours goes by effortlessly, anchored by Lancaster’s thunderous performance and the well drawn characters surrounding him, particularly Arthur Kennedy’s reporter. It probably isn’t quite the stinging indictment of the evangelist business it once was, chiefly because we’ve had our own share of real-life Elmer Gantrys, but it certainly raises some good questions about what it means to believe, what we expect from others and ourselves, and the fact that at some point religion became just another commodity to peddle to the masses, like the vacuums, irons, and toasters Elmer was originally selling. For awhile at least, even Elmer bought into his own con, but finally when the con had played itself out, he smiled, fired off a few last banalities to a once again adoring crowd and walked off to catch a train out of town. The circus was finally leaving and though no one was any closer to God than when it arrived, they were treated as were we, to one hell of a dog and pony show.